Do you want to purchase a new juicer? Are you stuck between a centrifugal juicer and a masticating juicer? Do you want to know the difference between a centrifugal juicer and a masticating juicer? If yes, read on. Both centrifugal and masticating juicers are designed to fulfill different needs. They are not flawless. But the best juicer type for you will depend on your own needs and requirements. The masticating juicer is a low speed juicer that chews and grinds the produce. The motor runs at a very low speed and squeezes out the pulp completely. This results in the best juice yield possible. There are also other masticating juicer types such as the triturating twin gear juicer. Out of all juicers in the market, the triturating twin gear juicers ensure the maximum yield possible and are the most expensive. They work just like masticating juicers by forcing the juice produce into a tiny gap between two cylindrical gears that rotate at a very low speed (80 RPM). The most common type of masticating juicers is the single gear juicers. But you’ll also find triturating double gear masticating juicers. These are often more expensive and much more effective. – The grinding and chewing action at a relatively low speed ensures the maximum juice yield possible. You get better yield than you would with a centrifugal juicer. 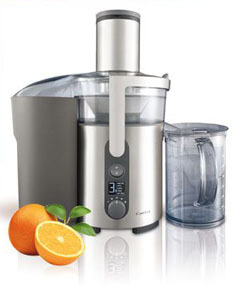 – This is an ideal juicer for all kinds of fruits, vegetables and leafy greens. The low speed of operation ensures maximum extraction of juice from leafy greens as well. – The best part of masticating juicers is that they maintain and preserve healthy enzymes. Low speed of operation ensures that no oxidation takes place and none of the naturally occurring enzymes are killed. The problem with centrifugal juicers is that their high speed of operation tends to cause oxidation and kills of healthy enzymes thereby reducing the nutritional value of the juice. 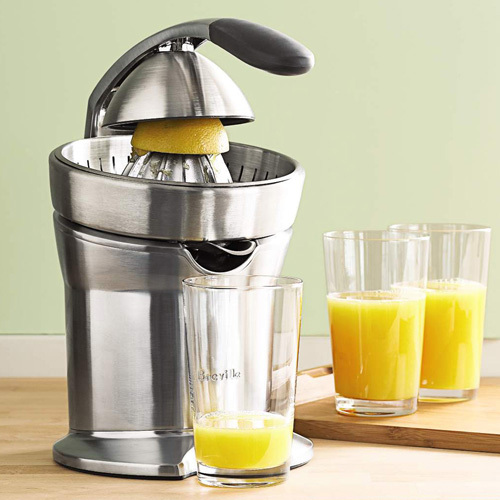 With masticating juicers, your juice retains all of its nutrients. – You can’t just toss whole fruits and vegetables into a masticating juicer. You have to prepare your fruits by chopping them down into small pieces and then feed them down the chute. – Since this is a low speed juicer, the amount of time it takes for juice to be prepared is longer. You’ll have to wait at least ten minutes before you get fresh juice from the masticating juicer. It may also take longer depending on the produce. A centrifugal juicer is quite common and is the most popular type of juicer. They are affordable and quite effective at juicing hard fruits and vegetables without requiring you to chop them down. They have a powerful motor that run at high speeds (usually in the range of 1500 – 6000 plus RPM). These juicers use a shredding disc that rotates at high speeds which in turn squeezes the produce and gets fresh juice out. The pulp is usually ejected into a separate container automatically by the juicer (in case of self-ejecting juicers). – Ultra fast juicing. One of the main reasons why people prefer centrifugal juicers is that they have fresh juice ready in under a minute. The high speed motor juices the produce extremely fast. – Requires no preparation. Well… if you’re someone that doesn’t really want to chop fruits and veggies before feeding them down, this is the juicer for you. These juicers come with extra wide chutes that allow you to feed whole fruits and vegetables without any preparation. – While centrifugal juicers are quite effective at juicing hard fruits and vegetables, they are not quite effective when it comes to juicing soft fruits and leafy greens. Centrifugal juicers offer less juice yield in comparison to masticating juicers. – The other problem with centrifugal juice types is that their high speed action tends to oxidize the juice and kill off healthy enzymes thereby reducing the nutritional value of the juice significantly.